As you might have seen, yesterday was the last day of ticket sales, and we have until now been very busy on social media during the last few weeks/months trying to spread the word further and getting more attendants to the conference. We have been busy on Twitter/LinkedIn and with direct emails. Also through our partners and through Oracle, we have spread the word. But unfortunately, ticket sales have been a disaster. We have reached only slightly above 50% of what we set as an absolute minimum for the conference so that we do not bankrupt ourselves. As you might have seen, we are a small company behind this initiative and when we set out on this journey we did so knowing that we would pick up the bills alone. This was calculated effort and accepted by us. Unfortunately – with reaching only 50% of the minimum of participants, we will face too high financial risks for our company and risk the future of our employees which is something we cannot do. It is, therefore, with broken hearts, we have to announce the cancellation of this year’s event. We sincerely apologise for letting you all down. We feel horrible about this but we have no other choices at this stage. What will happen with next year – we still do not know, but should we go ahead with #malagAPEX19, all ticket holders for #malagAPEX18 will receive a free event ticket next year. All current event tickets will, of course, be refunded fully – and you should receive details of this through Eventbrite. We are really REALLY sorry for ending up in this situation and would like to send our most sincere apology to all our Attendees and Speakers. We never anticipated this happening and we cannot understand why…. Where did we go wrong? What did we not do? Was it the wrong time of the year? Too many APEX conferences already? We still have very strong feeling about malagAPEX becoming a great conference because of the feedback we have already received. We would really appreciate your input regarding any future events. We have already been in touch with some of the speakers and some of them will still make the journey to Malaga to enjoy our fantastic surroundings, the sun and the beaches. If any of you participants still plan to travel to Malaga / or are local to Malaga, we are planning a little “Band-Aid” day for you. 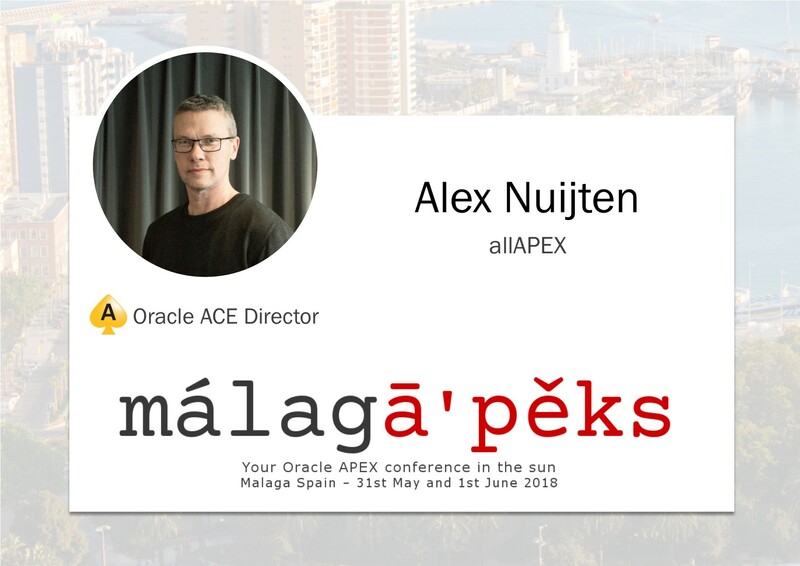 If enough of you are still coming to Malaga and are interested, we will plan for a FREE APEX Day in our offices with the speakers that decide to come to Malaga anyway – on Friday, June 1st 09:00 – 18:00. Please do let us know if you want to attend this free APEX day by emailing us asap. Based on your feedback, we will decide if this FREE APEX Day will go ahead and communicate this to you all within the next few days. Please accept our most sincere apology for this and hope to see as many of you as possible on the FREE APEX Day. Ticket sales are about to end! How is everyone doing?? 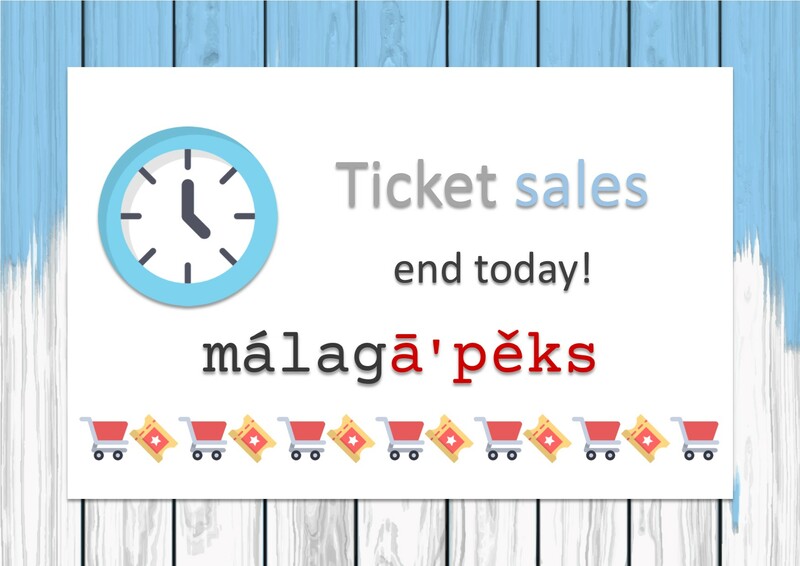 We wanted to let you know that we’re getting closer to #malagAPEX18, and the tickets’ sale is about to end! If you don’t have your tickets yet, or you know someone who’s missing them, run to the tickets’ platform before it’s too late! We’re really excited about the upcoming event, and really wish to see you all here very soon! Stay tuned to our twitter account (@malagAPEX) to get the latest updates! We’ve already spoken about this prolific speaker and Oracle ACE Director: Roel Hartman. You can overview some other of his sessions’ content in this blog entry (regarding APEX JET Charts) and in this other one (where he talked about Interactive Grid tweaks). This session will briefly cover the Docker basics, but then we will dive in into the more intermediate use of Docker. 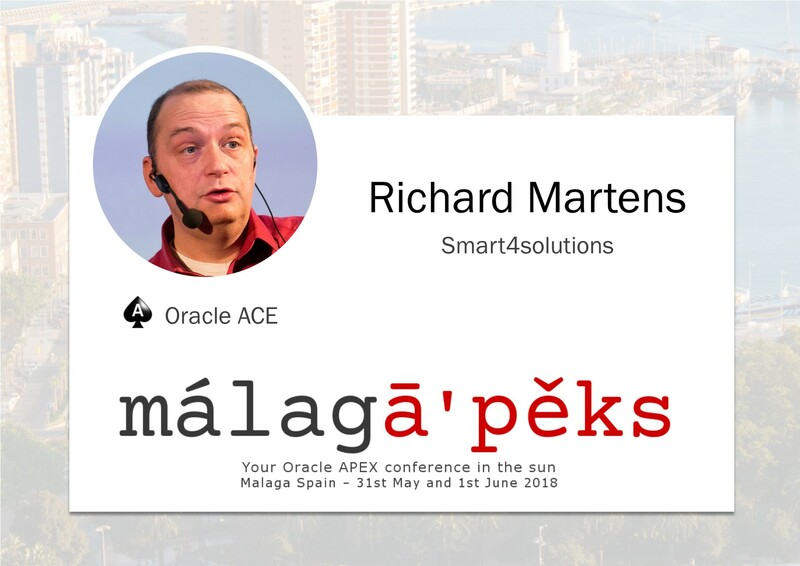 We’re really excited about all the sessions coming for #MALAGAPEX18, so don’t forget to get the latest news at our own twitter channel at @malagAPEX, get some other ticket for your colleagues or for your employees at the ticket’s platform and don’t forget to follow Roel’s twitter account at @RoelH. Stay tuned for more! Alex Nuijten is a very well known Oracle ACE Director, about whom we already spoke before in this other blog entry when we introduced his session about structuring an APEX app. Today, we want to talk about his second session: Life after Forms: The Move to APEX. For those of you who have been working with Oracle technologies for a while, it’s a great opportunity to go forward for better tools that the ones that used to be standard. Companies struggle with the question: Should we move to APEX when the time has come to let go of Oracle Forms? This session will tell the story of a migration project where the Oracle Forms application needed to be replaced with an APEX application. What could we have done better? What are the lessons learned? What was the best choice that we made during this project? Not from the books, but from experience. If you don’t want to miss anything of what Alex has to say, don’t forget to follow his Twitter account at @alexnuijten. He’s already proved that he owns a great knowledge to share. Run to get your tickets if you haven’t got them already here, and don’t forget to stay tuned to our Twitter account (@malagAPEX) to get the latest news about #MALAGAPEX18! 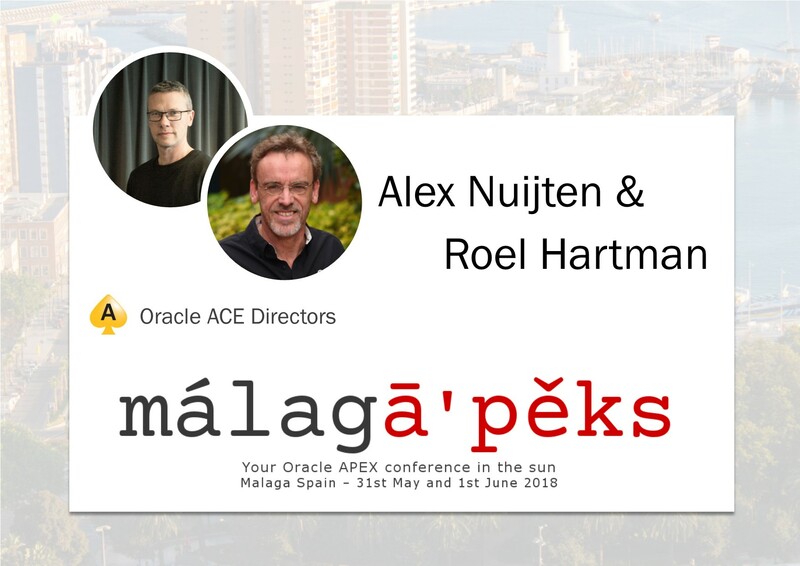 In this occasion, we want to talk about a session shared by two of our great speakers, Oracle ACE Director both of them: Alex and Roel. Go to their speaker pages to get more details about their other sessions for malagAPEX18. “When you develop an APEX application, it doesn’t matter if the database is in the Cloud or on Premises” is often heard, however this is not entirely true. When your database is in the Oracle Cloud there are some things that you need to consider. Part of the Oracle Database Cloud is the Oracle Developer Cloud Service. Why not take full advantage of that? It has a lot of bakedin goodies, such a Build server, Code repository and even SQLCl for your own scripts. In this session we will show you how to set up your development environment with Oracle Database Exadata Express Cloud Service, Oracle Developer Cloud Service, Oracle SQL Developer, GIT and all other bits and trinkets that we used for a recent project. Creating an APEX application on premises is different than building in the cloud. One of these differences is that you get a fully integrated environment for developing, version control and deployment. From experience we have worked with the Developer Cloud Service when we created ClocWise.org Sometimes it is very easy, sometimes it is … not. If you don’t want to miss anything of what Alex or Roe have to share, don’t forget to follow their Twitter accounts at @alexnuijten and @RoelH. Run to get your tickets if you haven’t got them already here, and don’t forget to stay tuned to our Twitter account (@malagAPEX) to get the latest news about #MALAGAPEX18! We already spoke about this great and experienced Oracle ACE Director speaker, Heli Helskyaho in this other blog post, so if you want to know a bit more about her background, just follow that link and know a bit better about her DB experience. Everybody is talking about machine learning. What is it actually and where can I use it? In this presentation, we will see some examples how machine learning has been used and we discuss what kind of skills are valuable and needed when starting with machine learning. Don’t forget getting your tickets if you haven’t done that yet, following this link, and get ready for this brilliant session! Follow Heli at her twitter account (@HeliFromFinland), follow our own Twitter account to stay tuned to the latest news (@malagAPEX) and keep the track of the hash #MALAGAPEX18! Richard Martens is a busy man and loves to share. At #MALAGAPEX18 he will be busy. As we said in this blog entry he’ll be sharing with us how to Validate User input with Oracle APEX, and in this blog entry, you can read about his session: Restful services and Remote SQL in Oracle. Since Oracle JET has been an integral part of APEX we have the option of using knockout.js shipped with APEX. Knockout allows us to use the Model-View-View Model (MVVM) which is very strong in relation to database-data on the web. It allows us to create highly interactive and dynamic pages. Best of all you don’t need to install anything. Richard also submitted few other abstracts, but it would be unfair from our side if we allow him to take over the whole conference. Any case, we might change our mind, so don’t forget to stay tuned to our Twitter account (@malagapex) to get the latest news on #MALAGAPEX18. The Interactive Grid – Let’s customise it! 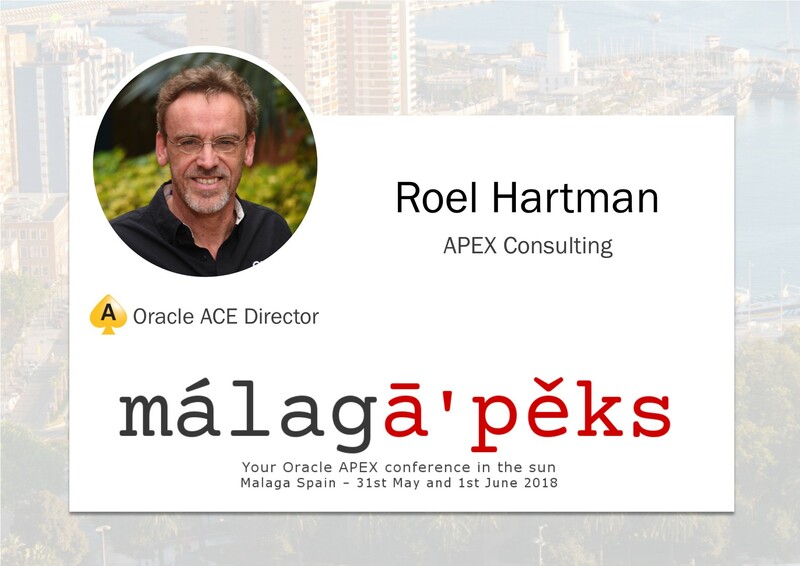 Roel Hartman is another speaker at #MALAGAPEX18 with more than one session. In this blog entry, we presented his session A Deep Dive into APEX JET Charts. Today, we want to highlit the session titled as Top Ten Tweaks for the Interactive Grid. Adding and removing buttons from the Interactive Grid toolbar. Adding and removing actions from the toolbar menu. Adding and removing functionality from the row level pop up menu. Removing complexity on the column level. Adding tooltips to a column. Changing the layout of columns and headings. Updating multiple records at once. Refreshing (only) changed records within the grid. Removing only deleted records from the grid – without a full refresh. Something else you must know is that Roel is a very active user at twitter, so feel free to follow his account at @RoelH, and remember to check out our own twitter channel at @malagAPEX to get the latest news about the #MALAGAPEX18! For this edition of #MALAGAPEX18, there are some speakers who will be sharing more than one session with us. One of them is Richard Martens. We spoke about another of his talks in this blog entry regarding (how to) Validate User input with Oracle APEX. There is still one more session from Richard (he’s going to be very busy), so don’t forget to stay tuned to our Twitter account (@malagapex) to get the latest updates about #MALAGAPEX18. And if you haven’t done so yet, go to this link to get your tickets! We also have speakers from the house, and today we’re more than pleased with talking about Trond Enstad. Trond is a Norwegian Entrepreneur and technical IT consultant, working in performance analyst and very well known troubleshooter. Trainer, mentor and public speaker, Oracle DBA – operations, development and engineering, Infrastructure – planning, sizing and engineering, Nearshoring/offshoring, ITIL, Multilingual and facilitator, with more than 25 years of technical experience in IT industry. Owner and CEO of OracleTuningGuy.com and novoshore.com. Integrating this type of services adds a great value to our apps, so you better put an eye on this session to get a bigger picture of what you can do with APEX. If you don’t have your tickets yet, follow this link and get ready for this session! 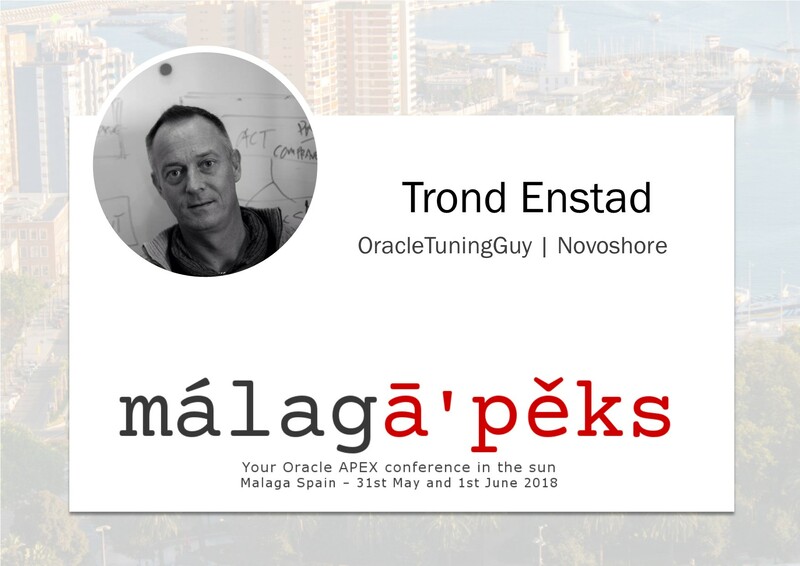 Follow Trond at his twitter account (@OracleTuningGuy), follow our own Twitter account to stay tuned (@malagAPEX) and keep the track of the hash #MALAGAPEX18!